A Greenpeace report accused Chinese vessels of illegal fishing in West African waters. 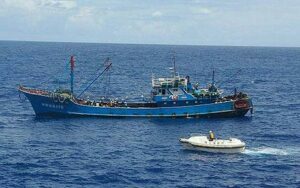 According to the report, the “number of Chinese-flagged or Chinese-owned fishing boats operating in Africa has soared in recent decades, from just 13 in 1985 to 462 in 2013.” Some of the boats referred to in the report belong to a Chinese state-owned corporation. However, the Chinese government dismissed the report. A government spokesperson told Reuters the Chinese fishing companies were strictly abiding by deals they had signed with African governments. China and the Djibouti military base question. Two weeks ago Djibouti’s president told AFP that his government and China had held discussions about the possibility of a Chinese military base in the Horn of Africa nation. Lina Benabdallah looks at the implications of a Chinese military base in Djibouti. Not only would it sit next to an American base in the same country, it would also be China’s first overseas military base. China leads developing world’s surge in foreign investment. Outbound foreign direct investment among developing nations grew by 30% last year. And, “most of the international investment that originated in a developing economy came from Asia,” with China providing over half of the money invested in other countries. Africa, unsurprisingly, provided the least outbound foreign investment. Chinese workers evacuated from South Sudan oil fields. Rebels in South Sudan ordered all oil fields in the Upper Nile region to shut down their operations. The rebels said proceeds from the fields are used to finance the government’s operations against them. China said it was evacuating its nationals in the region. China sent peacekeepers to the country last year. Chinese-model for South Africa’s planned state-owned drug manufacturer. Science and Technology Minister Naledi Pandor says the South African government intends to “emulate China’s approach of earmarking a share of state contracts for such businesses.” South Africa has failed to attract investors for the venture. Talks between Zimbabwe’s Cottco Holdings Ltd. and Chinese fund collapse. Cottco, sub-Saharan Africa’s biggest cotton company, is as a result looking for a funding partner elsewhere. Talks between the loss-making and heavily indebted company and the China-Africa Development Fund fell through. Chinese company to open woven bag factory in Ethiopia. Shaoxing Li Enterprise will open a woven polypropylene bag factory in North Shewa, Amhara Regional State, 64 kilometres from the capital Addis Ababa. A number of Chinese companies have moved manufacturing to Ethiopia (and elsewhere in Africa), attracted by its cheap labour. However, the company is complaining of “power interruptions and unavailability of network” which it says make it difficult for it to operate. China companies accused of evading taxes in Zambia. According to the Zambia Revenue Authority (ZRA), China Civil Engineering Construction Corporation (CCECC) did not pay any tax to the Zambian government in a $150 million contract to develop the water supply system in Lusaka. China’s ZTE Corporation was also accused of failing to pay any tax on a US$93 million contract with the Zambia Electricity Supply Corporation Limited (ZESCO) to install fibre-optic cables across the country. Kenyan woman sentenced to death in China. A young Kenyan mother left her home saying she was going to look for work elsewhere. Her family did not hear much from her, until a call came through one day informing them that she was on death row in China after being arrested for trafficking drugs. Kenyans have used her case to discuss China’s influence in the country, according to BBC. China and Zimbabwe’s “all-weather” friendship. Emmerson Mnangagwa, Zimbabwe’s vice president, told a Chinese business delegation visiting Harare that his government was indebted to China for sticking with them even as the West gave them “hell”. Ghana’s illegal gold miners. Ten Chinese nationals accused of illegal gold mining in Ghana also face charges of illegally possessing firearms. Chinese nationals robbed in Namibia. Two Chinese nationals were robbed of $84,000 in Namibia. Four men broke into the home of Wang Guiwei (43) and Yang Xiaojuan (37) and held the two at gunpoint, tied them up and made off with goods and the cash.